How's 'bout that FDA, gentlepersons? Oy vey iz mir. Sample courtesy of Mr. ____ __________, of _____ ______ Cigars. Rustic construction. Goodly tooth. Seams a tick shy of tight, but evenly done. An even mocha complexion with a peanut butter under-hue. Some espresso bean marbling over-top. A light amount of dense sheen covers it all. Cap is tight and in rustic keeping. Foot tobacco is auburn to brunette and packed in a medium+ manner of density. Veins are present but not a huge deal, and the somewhat lacking of them seems to belie the whole rustic thing -- or more likely serves to show it done with an artisan's intent. Hand-feel is rough-textured but not coarse. Oils work up in a heavy fashion as I fumble the thing. The top-leaf feels thick. The heft is perhaps a tick toward light. Charmin squeeze test shows and even and robust medium with a quite ready spring-back. Balance is nice and the press format has the 54RG resting comfy in my mitt. Schnozzing the shaft I get chocolate laced tobacco atop farmed and nutrient-rich earth. Swinging to the foot, I get an additional nutty coffee note addition. There is a pepper vibe throughout and it stays in my nose after sniffings. I use my Xikar Xi2. Very nutty cocoa cold pull. Coffee and cream finish. Underbelly is healthy topsoil. Some warm red spice rack is noted. Yums. Yums plus chocolate. Toasting the foot lets loose a woodsy, nutty, coffee aroma. All notes thus far seem to play well together and seem ready to churn out complexities. First hot tug is Chocolate, a dark thick note. It's up-top with a nutty note that's roasted and seems to have a quite leathery accompaniment. As the chocolate wears on from initial draw, it gets seasoned with warm reds. Middings are a heavy coffee and cream, oils from the leather, some pepper-play. 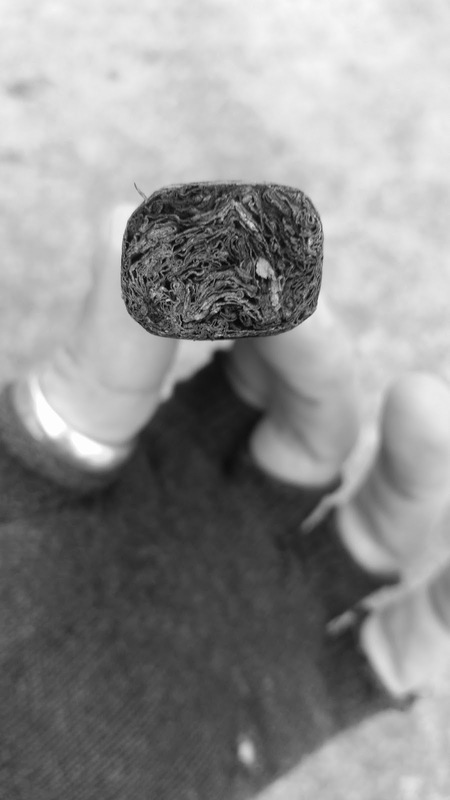 Underbelly is farmed rich topsoil with an inherent peat quality and sweet finish. Second hottie is retro-haled to smooth pepper mix of mainly black and white -- but red is there at first zetz and a glimpse of vegetal vibrant green bell is there at end. Tobacco, a heavy dark yet sweet note, lays into the bottom middling and bulges to the underneath. Third hottie is a settling which tells me we are under-way. There's a fudgier chocolate on the finish with that newer tobacco and warm red ghostings. medium+ at least legs. Profile is out of the gate at medium+ and robustly so. Strength is a -medium for now. Burn-line is even and thin. Ash shows tooth of top-leaf and is light to medium grey in very tight, even ladder-rungs that are nigh a sheath. Construction didn't budge a tick on light. Draw is a slight medium+ with just a hair of tension. Smooth and even delivery. A definite hickory is on-board and in the high middling. Flavors all toast sweetly. Mouth-feel is a bit toward moist but nothing egregious. I do notice the cap is quite wet. Smoke out-put builds in wide pillows. A creamy texture plays well with toastings. Very chocolate and woodsy. Very nutty and leathery, then. Thereafter, very rich earth and tobacco. Striding and unfolding in well-crafted lock-step. Espresso now swirls throughout. Strength to medium. Profile to -full. Very dense. Rich. Nice. Verily so. Roasted peppers, all a' them... red, black, white, green... are warm on the retro and reappearing on the lengthening finish in a lively sorta way. Pace of smoke is slow to the point of methodical and nigh menacing. Somber. Flavors delineate yet still serve to enhance one another. A heavy inch of ash clumps off. Black bread enters and starts to drive the profile from within a wood oven. Hickory is a separate and distinct note that is at work in the coffee and cream. Espresso is yet another distinct note which sees parts of itself play with parts of the fudgy yeasty chocolate. Leather seeps greater oils; and a salted buttery note comes into the whole deal. Tobacco note darkens yet further. Herbs begin to enter, lacing the middlings. Draw is spot on. Construction and construction are anchored in near perfection. Strength is medium+, profile full. Mouth-feel is just right in terms of moisture and the peppers leave in their wake a kind tingle on my palate. Lips and cheeks are leather oils and butter, salted sparingly. Hand-feel is oily and lively... the wide ring fits nicely in my fingers and smoke-hole due to the pressing. Room-note is the interior of a gentleman's study. 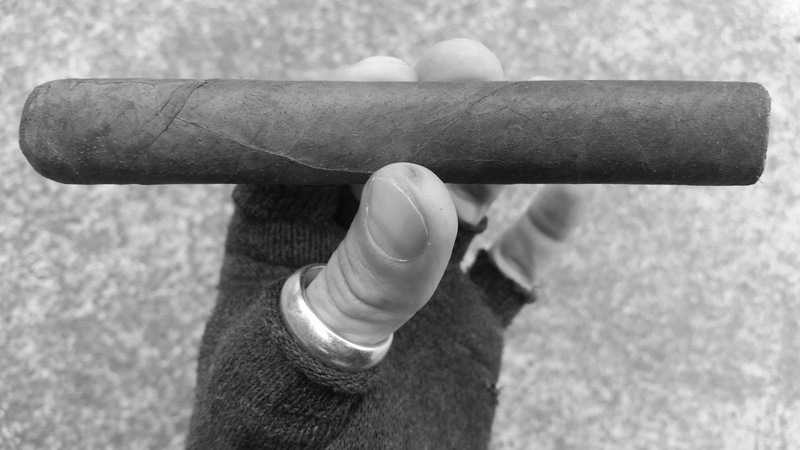 Heavy woods, oily leathers, and rich inherently sweet tobacco. Burn is even and steadily paced. Burn-line un-evens a bit, but self-corrects faster even, than the burn. Ash darkens. A caramelized sugar sets into the lower primary notes, rests on my palate. Black bread toasts. Under-belly soars and heightens the flavor profile on its shoulders. Full, across-the-board profile. A chewy mouth-feel is the now. Still, all is balanced and in the same even-keeled sort of manner. A very solitary and thought-provoking cigar, this ???. It's a do not disturb sign on the knob of a locked vault, dig? Nuts are pale and roasted dark, but still fleshy enough to be near creamy. Peppers roast and sedate some on the draw -- retro-hale remains the same zetz with a somewhat smoothed over delivery. Herbs go there to accompany. Hickory gets a creamy cedar bracing. Caramelized sugar turns the espresso Cuban. At the half-way point, a sweet roasted meat savoriness flows in and I smack my lips. Burn rate is unchanged and I'm almost entranced by this ??? offering. Box press holds nicely. Ash drops at a very near to slight beyond inch throughout. Hickory verily soars next to the new savoriness. Smoke flies, pours, et cetera. Draw stays same, but smoke-hole gets filled even more so. Retro-hale, gentlepersons. Herbs take the forefront on the back of a roasted pepper medley. They mingle with the roasting meat draw notes and it's a zero calorie stew, I tells ya. Woods are the under-belly there. A sharp smoked hickory softened by an accompanying creamy cedar. Cuban coffee is lower middling and into the finish. Body is supple leather and its creamy oils. Nuts lace the profile. So pretty. So hearty. A farm girl in her Sunday best. I'd rather ya not. I mean if it's all the same to ya. "Adversity reveals genius, prosperity conceals it." - Horace (See prologue).